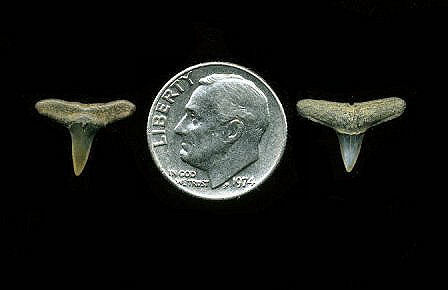 The teeth of the lemon shark (Negaprion eurybathrodon) are one of the more common Tertiary finds in NJ. 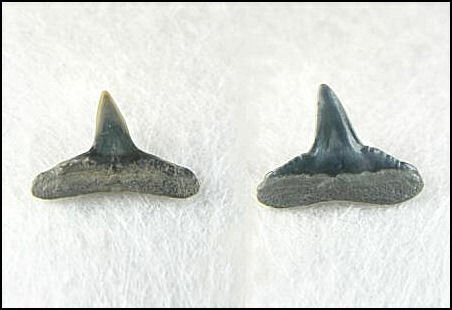 There is a marked difference in this species between the upper and lower teeth. Upper teeth have weak to indistinct serrations on the shoulder which may continue part way up the crown, while the lower teeth have an erect narrow crown and smooth shoulders. If not worn away by stream action, a shallow nutrient grove is present. These teeth average a little less than ½ inch and rarely exceed 3/4 of an inch in length. Regardless of tooth position the main cusp is perpendicular to the root, or at best, very weakly angled. These teeth can easily be confused with those of the gray sharks (Carcharhinus). The teeth are small with a “nail like” shape. 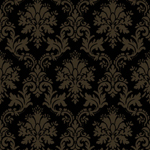 Left - A lower tooth with a smooth shoulder. upper teeth can vary from fine to wave like. The main crown of the lemon has a smooth edge.